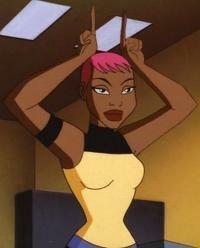 In the animated series, Batman Beyond, "Maxine Gibson was the smartest girl of Terry McGinnis' class. She figured out his secret identity after a fight with Terminal, the would-be valedictorian Carter Wilson, and his Jokerz." Known as 'Max", Maxine is a computer hacking genius that is a close personal friend and has helped the new Batman on various occasions. Like the show's title character, Max was invented for the show but has since shown up in the current ongoing Batman Beyond comic and is apparently an important part of the cast. There are absolutely no romantic ties between Max and the Batman. Her importance to the cast seems to be her hacking ability and that she can be trusted. Max is smart, pretty, resourceful, and a good friend. She is still in High School.